Tiger Woods ('96) joined his friend and former Stanford roommate Notah Begay ('95) in Notah's Skins Game benefitting disadvantaged Native American youth held today at the Turning Stone Resort in central New York state. Also playing in the Skins Game with its $500,000 purse is former Masters champion Mike Weir and Camilo Villegas. VERONA, N.Y., Aug. 24 /PRNewswire/ -- Tiger Woods, the world's No. 1 golfer, outshot an all-world foursome that included Camilo Villegas, Mike Weir and Notah Begay III to win the second annual Notah Begay III (NB3) Foundation Challenge. Taking nine skins and $230,000 during the 18 holes played on Monday, Woods successfully outplayed both the field and the challenging Atunyote Golf Club course at Turning Stone Resort & Casino in Verona, N.Y. The tournament raised at least $750,000 for the Notah Begay III Foundation. "Today the whole thing was about bringing awareness to what Notah is trying to do," said Woods shortly after the Challenge concluded. "It's great to see what he's doing. He's put his heart, soul and passion into it." Here's the complete story about the event. The one-day event raised $750,000 dollars for Notah's foundation giving back to his Native American heritage as the PGA Tour's only full-blooded Navajo. General info about the event can be found at this local website and at Notah's website --- notah.com. This month marks the 50th anniversary of Bob Rosburg's PGA Championship triumph at Minneapolis Golf Club. The table was set, and Bob Rosburg had the dates circled on his calendar. Fifty years after "Rossie" won the 1959 PGA Championship at Minneapolis Golf Club, he was planning to commemorate his Minnesota milestone at Hazeltine National Golf Club during the 91st PGA Championship at the age of 82. However, the articulate Rosburg passed away on May 14 from injuries sustained in a fall two days prior outside a restaurant in Indio, Calif. But Rossie's victory half a century ago, in the first stroke-play PGA Championship conducted in Minnesota, will be remembered, celebrated and commemorated at Hazeltine National when the world of golf converges this week. Rosburg, a native of San Francisco who resided in La Quinta, Calif., in recent years, chuckled earlier this year when recounting his 1959 PGA Championship triumph. He certainly earned his major title with closing rounds of 68 and 66 to finish a single swing superior to Jerry Barber and Doug Sanders. But when reviewing his '59 victory during a taped interview, Rossie acknowledged that he was "very fortunate" to win the 1959 PGA Championship after coming from six shots back on the final day. "I've always said timing is everything in golf, and I was on the good side of timing at the PGA Championship in 1959 after being on the other side of timing at the U.S. Open earlier that year (at Winged Foot Golf Club)," recalled Rosburg, who didn't hit a single practice shot all week due to the scorching heat. "Looking back, I probably should have won the Open and not the PGA (Championship). I had a good final day at the PGA (his 66 was the low round), but Jerry Barber bogeyed the last two holes and kind of gave it to me. I had finished a little earlier, and Jerry looked like he was going to win it. I was surprised when he bogeyed the final two holes." 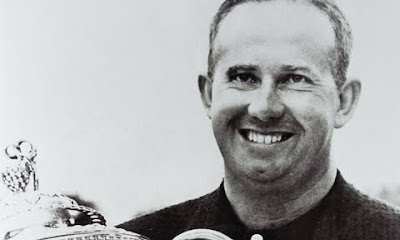 Rosburg used a similar, late-charging strategy to nearly win the 1959 U.S. Open at Winged Foot Golf Club in Mamaroneck, N.Y. In those days, the final 36 holes of the U.S Open were played on Saturday, but a rainstorm pushed the fourth round to Sunday. On another blustery day, Rosburg's 71 matched the low round of the day by host PGA Professional Claude Harmon and longhitting Mike Souchak, but third-round leader Billy Casper posted a final-round 74 to edge Rosburg by one shot at 282. Ten years later, Rosburg missed a three-footer on the 72nd hole and finished in a three-way tie for second at the 1969 U.S. Open, one stroke behind Orville Moody. Casper remembers Rossie as a superb putter and a supreme competitor. He also recalls Rosburg's sense of humor and sense of golf history, which served Rossie well during a 30-year career as a roving on-course reporter during ABC-TV golf telecasts. "Rossie and I were both considered pretty good putters and we were both from California, so we had some things in common," notes the 78-year-old Casper. "During those years, the greens on most courses we played were scraggly and slow, so we were always figuring out a way to punch the ball with our putters. After Bob finished second at Winged Foot, I was happy to see him win a few weeks later in Minnesota at the PGA Championship (where Casper tied for 17th)." At Winged Foot, Casper made headlines with the unique strategy of laying up short of the deep bunkers on the par-3, 216-yard third hole each day. Rosburg never let him forget the ploy. "Bob was mad at me. He says, 'You beat me by one shot and laid up on the third hole every day.' Every time he saw me, he mentioned it," says Casper. "It was a 2-iron or 4-wood to the green, and I hit a 5-iron or a 6-iron short of the green and pitched up every day. Fortunately, I pitched close enough to hole four putts and make par every day. "Rossie thought that was crazy, but he mentioned it on television several times years later when he would be part of the U.S. Open telecast for ABC. He never forgot that." At the age of 12, Rossie earned local acclaim when he defeated retired baseball Hall of Famer Ty Cobb in a club championship match at The Olympic Club in San Francisco. After losing to the 12-year-old prodigy, Cobb was seldom seen playing at Olympic. The son of a doctor, Rosburg went to Stanford and earned a degree in humanities after leading the Cardinal to the 1946 NCAA Golf Championship. The complete article can be found here at the PGA.com website. A 5-part video interview with Bob Rosburg in 2008 was completed by the Stanford men's golf program and can be found here: http://stanfordmensgolf.com/stanford_greats/bobrosburg.htm . Senior Joseph Bramlett is on the mend and finally able to compete again. A major step back to the 2nd team All-American caliber play Joseph had in 2007-08 was his recent qualifying once again for the US Amateur to be played at Southern Hills Aug 23-30. Joseph finished 2nd in sectional qualifying to teammate Jordan Cox with a 138 total at the Peninsula Golf and Country Club in San Mateo, CA. In an article written in the San Jose Mercury newspaper, Joseph talked about what it's like to compete again after his injury battles. "I'm excited to get back to competition," said Bramlett, a long hitter who tore ligaments in his right wrist. "When bad stuff happens to you, you tend to grow. I appreciate the game so much more. When I make double [bogey], it's not the end of the world." "It's just fun getting out and competing again," Bramlett said. To read the article click here.